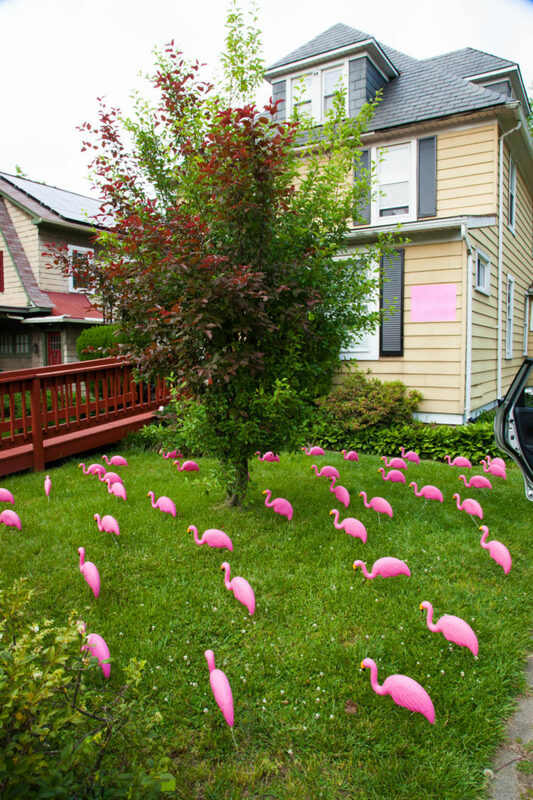 In order to celebrate Pink Flamingo Day on June 23rd, I flocked my friend, April’s, yard. 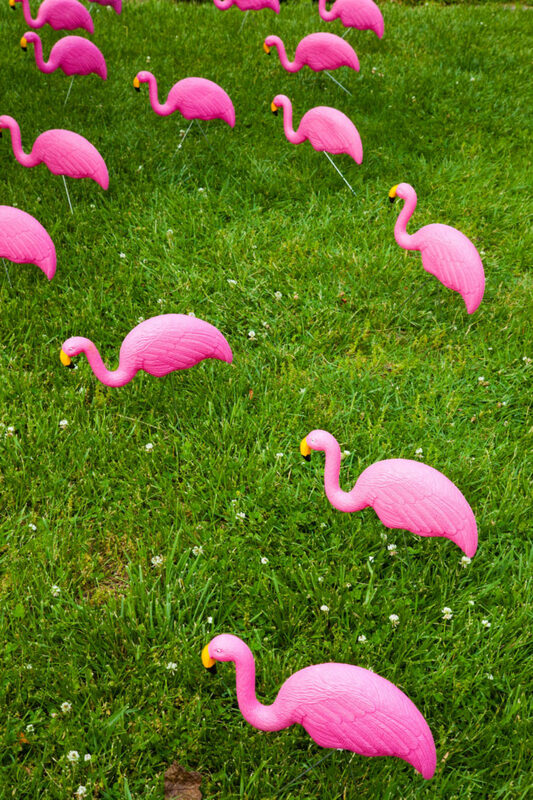 Flocking is a term that exists solely to describe what you do when you cover someone’s yard in flamingos. Isn’t that incredible? I love it so, so much. 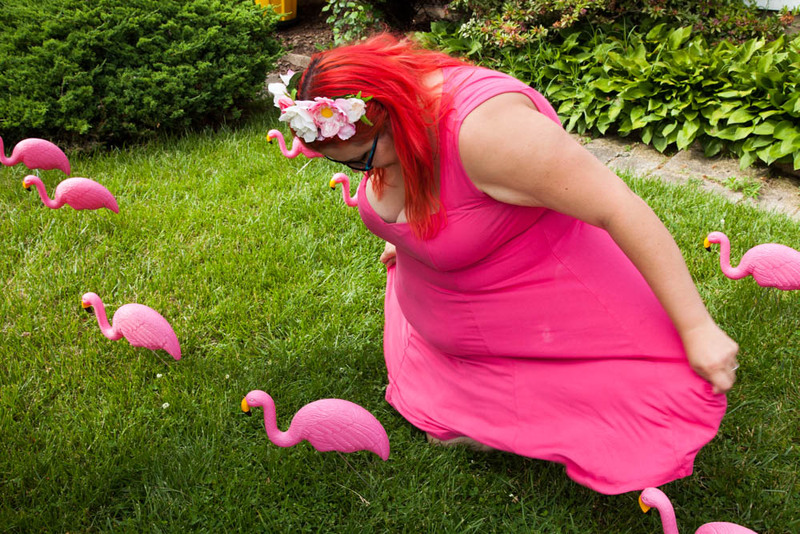 It was something I wanted to do for a long time, but I couldn’t find flamingos anywhere that weren’t over a hundred bucks for a lot of them. Just in time, though, Dollar Tree started stocking them in their summer section! I bought out a bunch of stores (and even had a sales clerk bring me out a brand new box from the back room so I could buy the entire thing). A dollar a flamingo? I’ll take it! I’ve always wanted to properly prank April. I’ve already talked about how amazing she is, and we like to prank each other, but I’ve never felt like I’ve fully accomplished it. Sometimes she’s home and I don’t realize it (one time she came out and asked if I wanted help! Ha! ), and then the one time I didn’t get caught it turned out she was on vacation so by the time she got back home the installation looked totally different. I wanted to prank her when I knew she’d be coming home soon to appreciate it in its new glory, but not get caught. I asked if she’d be home because I wanted to prank someone that day, and she said unfortunately no but to let her know next time. Little did she know she was the one I’d be pranking! So I knew she’d be gone at least for the beginning of the afternoon, and Maura and I went there as soon as we could. We stuck the legs in all the flamingos, took off the stickers, stuck them in the yard, and I posted three hot pink posters on her house that read, “YOU’VE BEEN FLOCKED!” just in case there was any confusion. As soon as we started to take photos of the finished flocking, her husband’s car pulled up past the house and I’ve never moved faster. I yelled, “GET IN THE CAR!” and we grabbed everything we could and shuffled into the car as quickly as humanly possible. I backed out of her driveway and started to drive down the street while I shouted, “THIS STILL COUNTS! IT STILL COUNTS!” and Maura was dying laughing. Then April’s car comes up the street and I just stop my car in the middle of the road, tell Maura to shove her head down under the dashboard, and pull the flamingo box in front of my face… because I’m super stealthy. She definitely knew it was me, but I’m counting it as a successful pranking. I was out of her neighborhood before she was out of the car. It totally counts! When I was buying a ton of flamingos at the dollar store, a woman asked me what they were for and I told her. She replied that she would be really mad if someone did that to her and I said, “Well good thing I’m not doing it to your yard! I’m doing it to my friend’s, who I know will appreciate it.” I know these kinds of things aren’t everyone’s cup of tea, but I knew my audience, and she even asked if she had to return them because she wanted to pass on the favor. Also, did you see the video of the guy karate kicking all the flamingos? That went viral at the perfect time. Love it!! Flamingos are my thing!! I like pink, I think pink makes the world very beautiful. I like this one. Pink makes the world brilliant. And people like pink are good to see each other in. I get it.